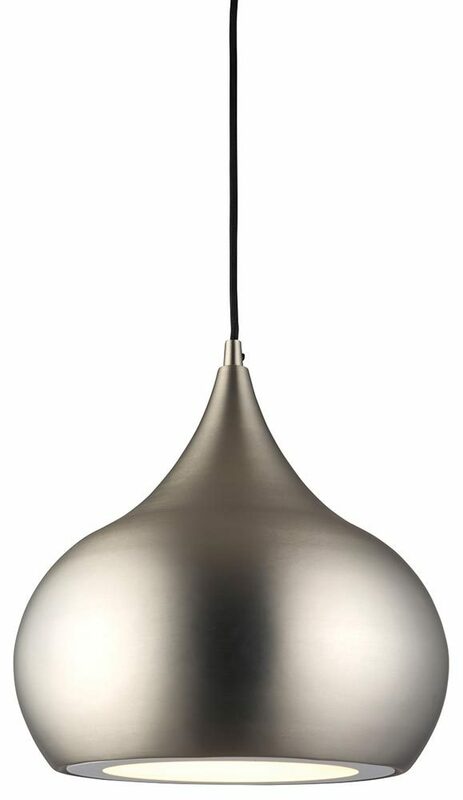 This Brosnan matt nickel finish dimmable 18w neutral white LED pendant light is on trend, energy efficient and perfect for over a dining table or as a kitchen pendant. Supplied with a manufacturers 3-year warranty. Circular ceiling mount and adjustable height black cord suspension, with tear-drop matt nickel finish metal shade containing a dimmable 18w neutral white LED module that supplies a bright 1480 lumens of downward light. The Brosnan LED lighting range includes an antique brass finish pendant that can be viewed below. Hello Viney, I have added a link to the installation instructions in the product description. It cannot be fitted directly to a plastic ceiling rose and must be attached to the included ceiling bracket. The driver is integral and not separate. Is the LED module replaceable? If so do you sell them? The LEDs in this Brosnan pendant light are integrated and not serviceable. However, they are rated to last many, many years and with a 3year extended warranty available, you can purchase with peace of mind.